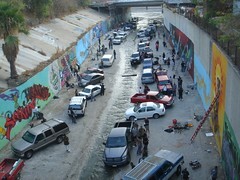 Wasn't easy organizing 200+ artists painting over 10,000 sq. feet of wall to wall productions, but we did it! Thanks to all who made this such a great event. It was overwhelming, but the vibe was dope. We'll be posting more as we get our senses back from all this madness! Why was part of this great work buffed on Oct. 25 or 26?